The last comic, this comic, and the next comic all came to me while I was in a strange, half asleep daze. I wish that happened more often. It makes the writing process much easier. 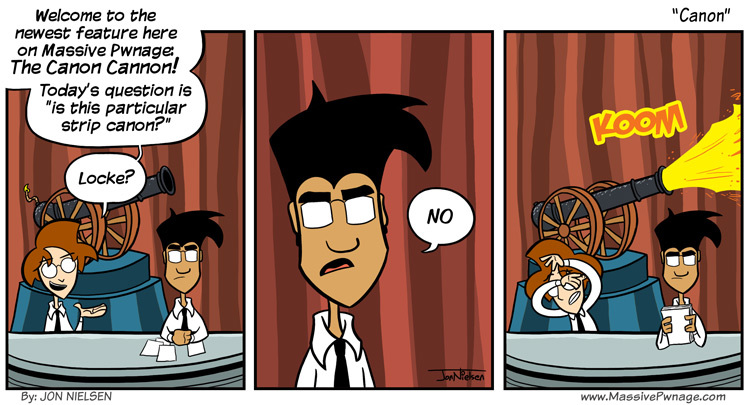 This entry was posted on Friday, December 31st, 2010 at 12:00 am and is filed under Comics. You can follow any responses to this entry through the RSS 2.0 feed. Both comments and pings are currently closed. They haven’t broken the fourth wall yet, have they? I once wrote a short story after seeing a mysterious door of light (the kind you shouldn’t walk towards, I think) on my ceiling in a fever. Do locke and ence know that they are in a comic?…these last two comics implied this. Conclusion: We are actually seeing short clips of a reality T.V. show with cheesy acting and lines. I was wondering why every time I enter the bathroom in the morning a camera flash goes off. I like the Canon Cannon. Good times. I wonder what would happen if someone got shot by the canon cannon…? Perhaps they would be… Canonized?